Mercy was proud to have two sports teams compete for the State Championship title. 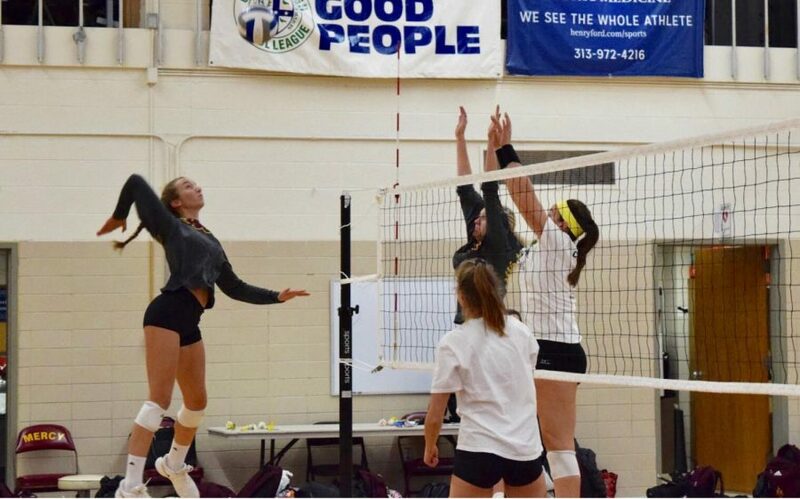 Mercy Varsity Swim and Dive (MVSD) and Mercy Varsity Volleyball (MVV) were among the top finalists in the state and competed against the best of the best in these championship match-ups. MVV’s season started in August and they have carried their season through to the very end. The team worked very hard and enjoyed much success throughout their season., including many victories in weekend tournaments against a variety of public and private high schools. The team also claimed the title of Catholic League Champions. After losing in the State-Semis last year, the team was determined to grab the State Championship this year. Sophomore Julia Bishop is a second year Varsity player. Bishop and the rest of the team has gotten closer throughout the season, and as States near, their motivation for playing is each other. The team has scouted out their competition for the Semis and feel confident they can win. MVSD has also been preparing all season long for States. The team has been going to meets since August and have been practicing non-stop, all in preparation for this final challenge, winning States. The team has secured high finishing places in their meets and won the Catholic League Championship. The team has done many team bonding activities throughout the season including motivational dinners with the whole team of 55 girls. Once the girls knew who would be on the State team, they did a State team dinner which carries many traditions but also prepares them as they talk about their game plan for States. Junior Chloe Pulick is going to States for the third year in a row, and she and her teammates feel the pressure to win States this year. Even with the added pressure however, the MVSD has been training their hardest to come out with peak performance at States. They have been practicing four mornings a week, and then also after school, trying to get as many hours in the pool as they can. The team has an urge to win because they know how hard they have worked this year, and every year, and know they deserve it.